Congratulations to the winners of Britey’s A-Mazing Game Show, Mr and Mrs Bingham from Sutton Valence, Kent. 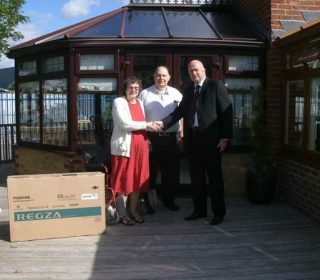 Mr and Mrs Bingham were delighted to receive their prize; a Toshiba 32″ HD-ready Flat Screen TV from Britelite Windows’ sales and marketing director, Simon Bourn. For your chance to win a flat-screen TV, as well as a saving of £100 off your Britelite installation, play Britey’s A-Mazing Game Show now. Update: Britey’s A-Mazing game show is no longer open. Find out all the latest news, offers and competitions in our news section.